What would you and your family do if there were no power, no water, no food deliveries, and no police for weeks or months on end? Y2K has come and gone, but many other crises know no time or season. You can be prepared for everything from terrorist attacks to natural disasters. Boston on Surviving Y2K explains exactly how to prepare your family. If you wait until a disaster is daily headline news, it will be too late to buy food, ammo, water filters, etc. Boston on Surviving Y2K remains one of the most important books you can buy. This is the Y2K book I wish I'd written! "Don't Get Caught With Your Pantry Down!" Thanks for your prompt fulfillment on my order. I stayed up to 2AM with Boston's book on y2k. He takes the "at least consider the 'worst case scenario' approach", as do I, and the details on specific products and sources should be very helpful. A weekly re-skim will help me to maintain the "if it doesn't wake you up at night you don't get the big picture" sense of urgency that the hour demands. I received the book, picked it up to browse and didn't set it down until I had finished reading it in its entirety. I found that it distilled a lot of information on subjects that you could spend hours researching into good, solid practical advice. There were some chapters I wished there had been a little more info. on but realize that you had to draw the line somewhere. I like the idea that you plan to keep updating it through the website as needed. Hope that happens. 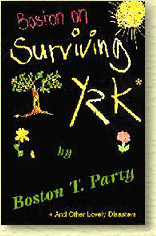 I think Surviving Y2K by Boston T. Party is very informative. In depth and with much back up info it covers why there is a problem, why it probably will not be fixed in time, and how to survive the upcoming troubles. Boston gives lots of resources as well as tips and is very knowledgeable about the subject and survival. A must read for any one who intends to live through any survival situation. when i read any of his books i get the feeling he is recalling events rather than giving ideas. what i mean is his perspective seems to come from experience rather than theory. i have read several books and zillions of articles on y2k but BTP is the only real practicle book i've read on the subject on individual preparedness. from where to live to what kind of generator to use he really gives a SPECIFIC blueprint for getting ready. no matter what level of interest and/or preparations one chooses to take on y2k - this book will have something for everyone. the recommendations are concise and easy to understand. the chapter on energy should be put in every home in america. i have recomended this book to many of my friends. ...The shining star of [the] Health [chapter], and in fact the whole book so far was the first aid necessity list. Excellent! That 2 pages was worth my money for the whole book. I have never recommended anything to anyone in this newsgroup, except to prepare. I have no financial interest or stake in this publication whatsoever. I am highly recommending that you get it so that you will have some brief guide to give you an idea what you need to do to get all the bases covered. It is VERY comprehensive, but it is not exhaustive on each topic. It is meant to be more than some pamphlet type quick guide to just about everything that you will need to know. I believe the cover price is $22.00 They also have great volume discounts starting from book number one. In my opinion, it is worth every penny and then some. Get two.